We planted a peach tree several years ago, and this year it actually bloomed and started making peaches. You may recall that early in spring, we had a wasp laying eggs in the peaches. We lost all but two. Those two survivors grew into the most beautiful peaches ever. They were round and red, and looked downright delicious. They grew right outside our kitchen window, and Amy and I have spent many hours gazing at them in anticipation. Saturday morning, I looked out at them and thought “Those things are just about ready to eat. Awesome.” Saturday after lunch, Elisse came in and said, “Did you pick one of the peaches? How did it taste?” Of course, we hadn’t picked a peach. Some four legged marauder had come by, IN BROAD DAYLIGHT, and pilfered one of our precious peaches!!! PREPOSTEROUS!!! My numerous exclamation points don’t even begin to convey the indignity and outrage we expressed while standing in our small kitchen. I ran outside just praying I would see the squirrel (of course, I’m assuming it was a squirrel) and dispatch him in a most heinous manner. No squirrel to be seen, so I shouted in impotent rage at the sky. Not nearly as satisfying as what I had envisioned, but it was all I had. One peach left. We picked it immediately, cut it into slices, and shared one peach among seven people. So our original 25 peaches ended up as just one peach. Not a very good ratio. But that peach was unbelievably good. We all stood around the cutting board in complete agreement. Best peach ever. We always grow lots and lots of rhubarb. It’s one of the first pieces of produce to ripen in the spring, and it’s great to start eating fresh from the garden in May. 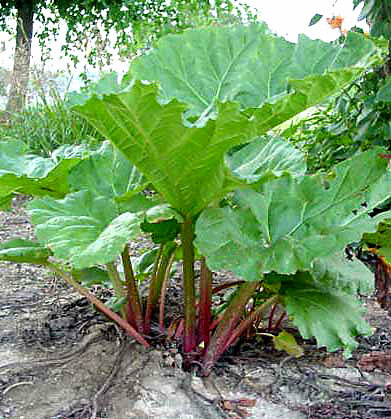 If you’ve never had rhubarb, it has the texture of celery, but is very tart - similar to a lemon. Only the stalks are edible. The leaves are actually poisonous. Since we always have a ton of rhubarb growing around our yard (2 or 3 gigantic plants) I decided this year I was going to find the perfect Rhubarb crisp recipe, and I kept making new batches (to the everlasting joy of my family) until I came upon this one. My search is over. This is the recipe I’m sticking with. I know there is a ton of sugar in it - but rhubarb isn’t naturally sweet like apples or peaches, so it needs extra sugar if it’s going to taste like a dessert. I am going to mess with the sugar content and see if I can swap out honey for some, or just reduce it. But for now, this is a great recipe. Enjoy. In mixing bowl, combine brown sugar, flour, oats, butter, and cinnamon. Mix together until crumbly. Press half of the brown sugar and oats mixture into a buttered 8 x 8 baking dish. Top with the sliced rhubarb. In a saucepan, combine 1 cup granulated sugar, cornstarch, water, and vanilla. Cook together until clear, then pour over rhubarb. Top rhubarb with remaining crumb mixture and bake at 350 for 45 - 55 minutes. Serve warm with vanilla ice cream. When we moved last fall, we left in the manner of the children of Israel fleeing Egypt. We got the hell out of there as fast as we could. Unlike the Hebrews, however, we left with the promise that we would return in spring to clean up all the crap we left behind. So this past weekend we headed back to the old house for some spring clean-up. We also transplanted our two fruit trees, an apple and a pear. They are both in full bloom - so if they survive the transplant, we should have fresh fruit this summer and fall. We lived at that house for 5 years - and each year we spent a great deal of time preparing the garden beds. We added compost by the wheelbarrow-full every year. We mulched and weeded and watered and turned over every year. In contrast, the new MCH is built on clay. Rocky clay. I know because I spent all last week digging post-holes by hand. Eventually there was so much clay piled around the yard that the kids started making sculptures to sell. I remember complaining about the soil at the old MCH - with it’s rocks and bricks and sand. But now, looking back, we had it pretty good. I know in five years our gardens at the new MCH will be just as nice - with rich black soil that grows anything and everything. But right now, I wish I’d spent more time enjoying the garden I had instead of complaining about how I wish it would be. Thankfully, I don’t have that problem in any other area of my life. Just with garden soil. We’ve finally started putting our fruit trees in the ground. Here’s the basics. 4. Place tree in hole. Make sure the base of the tree is right at the finished ground level. Too deep or too shallow will kill the tree. 6. Mulch the top of the hole, and form a donut shape of soil / mulch around the base of the tree. This basin will catch water and send it towards the roots. 8. Water the tree at a steady drip for 30 - 60 minutes every day. 9. Marvel at the following diagram. Yesterday I got a call from Amy while I was at work. I’m not exaggerating when I say she was breathless with excitement. Apparently Sam’s Club had just gotten their shipment of fruit trees in for spring. There were tons of different types, and they were only $17 a piece. That’s cheap - like end of the season 50% off cheap. But there they were - fresh off the truck, many with blooms and buds. Our track record with fruit trees isn’t the greatest. Two years ago we bought a tiny Fuji apple tree that not only bloomed, but started growing apples. Real, live, organic apples. That little stick of a tree had 18 apples growing on it by the end of summer. I could almost taste the apple pie. Then, one morning, I came out to find only 17 apples on the tree. I figured one probably fell off, or the kids grabbed one, etc. On the morning of day two, only 16 apples remained. That continued for two weeks until not a single apple was left. I even stayed out late at night trying to spot the thief, with no luck. The next year, we had lots of foliage, but no blooms, and no apples. Apparently, the second year after transplanting, a tree will work very hard at extending it’s root system, and not so hard at making fruit. So we’ve gone through two years with no fruit. I have high hopes for this year, though. Our original yard plan has 4 fruit trees. We have the apple tree from two years ago, and a peach tree from last year - so I figured Amy would buy two more to fill out the yard. I should have known better. When I came home there were six young trees lined up neatly in our side yard. Adding the two we already own, that makes a total of eight. That’s a lot of trees. The story doesn’t end there, though. It’s late March in Michigan. March is supposed to come in like a lion and go out like a lamb. But this March came in like a lion, and is going out like a slightly smaller, far wetter lion. We had 3 inches of snow and low in the 20s last night. Not good for delicate buds and flowers. Here’s our solution. Our orchard of two pear trees, two cherry trees, and two plum trees is now growing in the mudroom until the weather gets a little bit warmer. Ironically, I had to stroll through a forest to let the dogs outside this morning. Monday the 15th is the day I’ve been waiting for all summer. We’re going to have a dinner with 95% of the food coming from our little tenth of an acre in the motor city. Rabbit pot pie, squash, greens - maybe even some homemade bread if I can pull it off. The last thing I wanted to pull together was a batch of homebrewed beer - but it was too hot to make it this summer. Maybe I’ll just finish the meal off with a batch from a local micro-brewery. I’ll post recipes (and maybe pictures) next week. Our potato crop took up a quarter of our garden for the whole season last year, so we’ve decided to try growing them above ground this time. Tips for maintaining a successful raspberry patch.